Absecon Police Department and Municipal Alliance Announce "National Night Out"
The Absecon Police Department along with the Absecon Municipal Alliance announces their "National Night Out" event for Tuesday, August 6th from 6 p.m. to 9 p.m, at the Pitney Road Soccer Field located at the cross of Crestview Avenue. 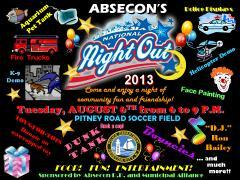 Absecon residents are welcome to come and enjoy a night of community fun and friendship. This is the 30th Anniversary of National Night Out and events are held in communities nationwide. The idea is to bring members of the community together in an effort to fight crime through community awareness, crime/drug prevention, and foster a positive relationship with law enforcement. The Police Department will be joined by various other local organizations and businesses, such as the Absecon Fire Department, Emergency Services Providers, N.J. Forest Fire Service, and many more. The 2013 Absecon N.N.O. Event will include an Atlantic City Aquarium "Touch Tank", Police Displays, a helicopter demonstration, K-9 demonstrations, fire trucks, face painting, bouncies, a dunk tank, and a D.J. for entertainment. Food and refreshments will be provided until supplies are gone.